Register TODAY! The 2011 European Strategic and Competitive Intelligence Summit in Vienna will a most fruitful value contribution to your career path in Competitive Intelligence through state-of-the-art learning and a most professional CI network you will be able to build and support. Please find the conference program below. Register TODAY and bring colleagues too. Web agenda and brochure are preliminary and will be updated as information becomes available. Eliana Benjumeda, Acciona S.A. and Mario Esteban, Acciona S.A.
William West, Cooperative of American Physicians, Inc.
David Gibson, Kaiser Associates, Inc.
Frank van Dijk, Bently Nevada, a division of GE Energy Netherlands B.V.
SCIP asks for proposals to speek at the 2011 Strategic and Competitive Intelligence Summit, 8-10 November in Vienna, Austria. As your Chairman for the 2011 Strategic and Competitive Intelligence Summit, 8-10 November in Vienna, Austria I would like to invite you to contribute to the Summit with your session or workshop. Below you can find the entire text of the Call for Proposals and the direct download links for the forms. The Strategic and Competitive Intelligence Professionals (SCIP) will present the European Summit November 8-10, 2011 in Vienna Austria. SCIP continues to develop and provide educational programming and networking opportunities for its members all over the world. The European Summit traditionally has one of the most diverse attendance and speaker constituencies of all of our conferences. The 2011 European Summit call for proposals will open on May 6, 2011 and will close on June 7, 2011. Once the proposals are reviewed and sessions selected, notifications of acceptance will be sent to presenters via e-mail. SCIP reserves the right to invite additional presenters to the program. All proposals must feature case studies and/or demonstrated best practices -- year after year attendees have told us they want to hear about successes and lessons learned in competitive intelligence practice. Proposals that provide case examples and professional tips for the audience will be given preference in the selection process. Below are areas of focus suggested by our content committee but proposals on additional topics are also welcome. Gaining influence is a critical part of any successful competitive intelligence program, because doing the right job and doing the job right sometimes is not enough. One needs also to demonstrate the importance and relevance of their work. It is not only a matter of merit, it is also a matter of how CI is presented and perceived.  Which tools were successfully used to increase the importance of CI within your organization, and how were they used?  How do you make competitive intelligence a critical component of your company?  How do you engage senior management in the competitive intelligence effort?  How do you secure the resources to complete the task (financial, personnel and others)?  Once the job is completed successfully, how do you increase the resources dedicated to the CI unit? Is that expansion actually necessary or desirable?  How do you effectively influence people within and outside of your own organization?  How do you make competitive intelligence an integral part of the decision-making process?  How should competitive intelligence support the sales organization?  How should a competitive intelligence unit be structured to support different decision making entities? Communication is a key element in effectively accomplishing the Intelligence Cycle, especially the communicating competitive intelligence products and enhancing the relationship between the unit and the decision maker. Speakers will provide an actual experience and ways that practitioners solved their problems and enhanced their CI unit’s performance. Examples of topics and questions to be addressed are: Starting and completing the intelligence cycle: identifying the right needs and delivering the right products. o How do you keep the competitive intelligence unit’s focus aligned with the decision-maker’s real needs? o How do you conduct regular assessments of management’s Key Intelligence Topics? o How do you obtain regular feedback from your decision-maker clients? Creating a good relationship and lines of communication with your decision-maker. o How do you encourage your decision-makers to use the CI unit and request challenging jobs. o How do you get your decision-maker to understand what information you need to do your job? How much of innovation has to do with insights, and how much has to do with hard work? An actual competitive intelligence process based on knowledge, alongside its systematic pursuit of information and its analysis can have a great impact on the innovation processes. o How can CI participate and boost the innovation process within companies? o What kind of CI outputs might be useful in the innovation process? o How do you use networks to foster innovation within your company? o Is it possible to create fruitful synergies between CI and the innovation process? Using CI to find unexplored markets. Using CI as an innovation tool in emerging markets. o CI as a tool in technology and organizational innovation. Applying technology innovation to boost the CI process. Intelligence is only produced through an analytical process that takes the information and evidences collected and works through them to extract meaning and significance for the decision making process. Analysis is a creative process that is done inside our minds. We can accomplish it with the help of frameworks and methodologies, or in an unstructured way in which we use our intuition and previous knowledge to create connections among data and drive conclusions. In this topic experienced practitioners are expected to share their knowledge on how they have successfully been using analysis to deliver Intelligence to their decision makers. Presenting your own experience on using traditional methodologies and their influence on the decision making process. This can be either on the tactical or strategic level. Case and results are expected. o How do you use short analysis to add value to the collected data? o How do you get organizational and shared knowledge to come to sound conclusions even without using any structured methodology? Explaining a new or a non-traditional methodology. o How it is done? o What are the steps and framework, and how do you arrive at a conclusion. Showing a successful case of developing collective analysis to solve a business problem. Intelligence is the radar of any company’s strategy. Managing a company’s strategy without a competitive intelligence process is like navigating through a fog without instruments. To develop and implement a successful strategy, companies must have a CI process that allows them to leverage from information and perspectives, thus becoming able to anticipate environmental changes, threats or opportunities, and establish goals and implement better strategies to approach it’s environment. Likewise SCIP’s name change reasons, CI and Strategy belong to the same discussion and must not be treated separately. Examples of topics to be addressed are: Connecting Strategy and CI: why both must be tightly related. o How do you fit CI in the strategy building process (conceptual discussion)? o What are the strategic aspects of CI, over the tactical aspects? o How do you introduce CI in the strategic decision process? o How can CI service influence a company’s strategy? o What are examples of successful participation of CI service in strategy elaboration process? Provide examples of successful CI service collaboration in scenario analysis process or War Games Providing examples of why CI and strategic management must be a symbiotic process. o How do you use CI in support of M&A, long range planning and internationalization. o What are some cases and discussions of M&A or internationalization process supported by CI process? Many doctors would agree that performing an open heart surgery is simple: one can learn the basics in 6 months. However, doing it right and learning what to do if anything goes wrong, or if there is any deviation from the original plan, can take many years. The same can be said about building up and managing a competitive intelligence unit. Examples of topics for speeches and questions to be addressed are: What does a properly formed CI unit look like; How to fix CI units that were not formed properly from the beginning; How to increase the effectiveness of your CI unit; How to develop the critical competences required from a CI unit and its professionals. The session presentations are 45 – 60 minutes in length and will be scheduled on the 9th or the 10th of November, 2011. The European Summit presentations can be in PowerPoint for those speakers who are in the practitioner category and should be in an interactive category without the use of PowerPoint for those in the solution provider category. Selected speakers will receive one complimentary registration to the main conference (November 9-10, 2011. This does not include registration for pre-conference workshops. Travel expenses and other related costs will not be compensated. Co Presenters: If a co-presenter is requested for the presentation, please define what that person would add to the program so that we can determine if this co-presenter would possibly qualify for a complimentary registration. Co-presenters will not be accepted after your proposal is submitted unless requested by the Program Team. Signed agreements are required for both Primary and Co-Presenters. Duplication: If two proposals contain similar content, selection will be based on both quantitative and qualitative merit. SCIP joins forces with the leading competitive intelligence training organization to offer global certification in the field. A joint venture between SCIP and ACI, the world's leading competitive intelligence training organizations, advances the profession's standards for this relatively young field through a quality certification program. Read the official press release from the Strategic and Competitive Intelligence Professionals (SCIP) society and the Fuld-Gilad-Herring Academy of Competitive Intelligence LLC (ACI). Download the .pdf press release. Another European SCIP conference - this time in Barcelona, Spain. Meeting old friends again and making new ones. Yet: something drastic was different: No air travel! A SCIP Competitive Intelligence Magazine article, by Jens Thieme and Michel Bernaiche. Michel and I - two fellows who originally met at a Northern European intelligence gathering - decided to make the trip to another SCIP conference a journey to remember. Read on my friends, you might be planning a cool appearance at this year's Vienna Conference just for kicks. Download the pdf version of this CIM article here. The European CI Summit, SCIP November 2010 in Barcelona attracted 200 attendees from 22 different countries around the world with attendees. But this is a story about a pair of friends who trekked their way through 5 countries over 4 days in an effort to continue and build their friendship that began at a CI gathering in Helsinki, Finland many moons back. When these two unsuspecting CI leaders in their respective companies Dunkin' Brands (the guys who feed you well even when Hotel Mom is closed for vacation) and Ciba (the former world leader in specialty chemicals, owned by BASF today), ventured to Helsinki to participate in a CI forum geared to providing insights and conversations that would lead to further development of CI programs around the world - little they guessed about the career successes and mutual adventures ahead. It was here, at an International dinner event that included such delicacies as pigeon, bear salami, frog leg and reindeer, that a friendship was born that should not only bridge continents but business fields as far apart as doughnuts and automotive additives. For years to come, these two thought leaders in the world of CI, would meet in 9 different countries over the course of 4 years for one reason or another but mostly for the good of CI. While chemicals and breakfast coffee hardly make a tempting combination these two remain just as passionate about CI as they did when they first met, though the true benefit of their meeting comes at the hands of the CI community at large. Jens and Michel as true ambassadors to the global CI cause have always remained interested in sharing thoughts, ideas and best practices in authoring, speaking and work-shopping in an effort to further elevate the relevance and longevity of CI. So their trip to this year's European CI Summit in Barcelona, Spain began in Zurich, where the two discussed over espresso on the Limmat river, ideas around where the next Euro Summit could be in an effort to improve and further strengthen the eastern European CI community. From there, they moved on to Bern where they had lunch and discussed the tough past two years that SCIP experienced and their related Board duties. As daylight dwindled, they arrived in the quiet Souther Swiss Alps town of Naters where the two took part in one of their favorite traditions, toastings. Onward, their travels took them to Lago Maggiore, Milan, Sion, Nice, Monaco and finally Barcelona - all by car - where they enjoyed seeing old friends and meeting new ones and the refreshing absence of air travel nuisances. Charged with excitement from these newly shared adventuresand an updated tool box of fresh ideas for the CI community that was to gather in Barcelona the two set out to enjoy the company of hundreds of CI related professionals and offered their experience in workshops, sessions and meetings again. While this profession proves time and again that it is not only exciting to engage in and build upon the global CI community offers value way beyond individual growth potential and networking opportunities: true friendship and shared engagement in the cause of progress as individuals and professionals don't know any boundaries here and this spirit was - once again - felt every minute in the meeting rooms and Hotel hall ways at the summit venue. While the hotel (Hisperia Tower) was situated a bit off course from the stunningly attractive inner city attractions of Barcelona the hotel itself made up for the taxi rides at night. First class rooms, top notch break out facilities and excellent food for main courses and as snacks soothed the senses all along. As the lodging and conferencing areas were separated in two main buildings the setup provided excellent access to the exhibit halls and major gathering places. Breakfast and afternoon snacks were offered right between the vendor community's booths and meeting areas which provided an outstanding opportunity for practitioners and vendors to stick together whenever outside of sessions. This energy and friendly atmosphere was echoed in the many break out sessions. With an increased focus on interactivity this year's summit has to be judged as one of the most active, energetic and result oriented events in the history of SCIP events! Many participants took away a tremendous amount of new contacts, fresh ideas and immediately applicable learnings. While the key notes could become a bit more actionable and strategic for summits to come there are additional feedbacks that offer requirements by our members and participants: accessible c-level executives should be lured in to the format more and more to gain insights into the voice of the customer for CI practitioner's services to their decision makers. Not to single out any of the sessions or workshops in this review but it bares mentioning that the most cheered upon speakers acted up to the challenge of increased interactivity with scores of creative ideas ranging from throwing candy into the crowd for active responses to mutually created work documents as key take-away's. As with any of the past SCIP summits sadness kicks in when bidding each other farewell, thanking all contributors and supporters for massive value that was provided and for all the friends who disperse into the wide world. While Michel and Jens have yet to share their first calorie laden doughnut together, the ongoing joy, fun and experience shared, beginning with bear salami and temporarily ending with the last Spanish tapas in some idle, yummy Barcelona down town bar - the mind is already set for next year's adventure: a train ride across Europe to catch that chocolaty Sacher Torte in Vienna (Google is and you will gain weight and appetite already) and add on more friends and value for our jobs, once again bridging industries and geographies because the chemistry is just perfect as enabled by those excellent SCIP summits. Find the current SCIP Competitive Intelligence Magazine here. Ever wondered why your edits in iPhone don't land in your MS Outlook address book? Me too, so I figured out how to fix it. I just loooove the iPhone Business Card Reader App by SHAPE Software. Simply take a photo of a business card and the OCR software creates a contact data card for your iPhone contact address book. Using a Windows PC, follow this step and make sure the iTunes sync add-in is enabled in Outlook 2003:. 1. In Outlook, choose Tools > Options. 2. Click Other and then click Advanced Options. 3. Select COM add-ins and select the iTunes sync add-in and click OK.
4. Click Apply and then continue with the steps below. Connect your iPhone to the computer using the supplied USB cable and launch the iTunes application, if it does not launch automatically. iTunes displays your iPhone on the left panel under "Devices." Click your iPhone on the iTunes panel and click the "Info" tab. Click "Sync contacts with" and select "Outlook." Select "All Contacts" if you want to sync all the contacts from your iPhone to Outlook. If you want to select specific contacts, click "Selected groups" and place a check on the contacts you want to sync to Outlook. Click "Apply" to sync your iPhone contacts to Outlook. Click the "Eject" button on the right panel and disconnect your phone from the computer. Close iTunes. Launch Outlook and click the "Contacts" tab. You should see the imported iPhone contacts. At this year's SCIP (Strategic and Competitive Intelligence Association) European Summit in Barcelona, Spain, November 16-18 I will hold another competitive intelligence related workshop. After the huge success at last year's Amsterdam Summit I was asked by SCIP to come up with an advanced edition of the workshop based on my past experience to establish and advance a global competitive intelligence unit. I truly hope to meet you all again at that SCIP conference. Contact me should you have any questions prior to signing up for that workshop. For participants in my last year's SCIP workshop: if you are ready to extend your CI unit's exposure throughout the organization this workshop is for you. There is about 30% overlap with the initial workshop which might serve as a refresher. Participants will work out and experience hands-on how to easily and structurally identify the CI function’s status and growth potential and how to exploit additional opportunities from within their own organization. Register for the SCIP Barcelona European Summit 2010 here. As a board member of SCIP I would like to announce SCIP's name change and provide some background information as well. After thorough debate and member involvement with wide spread debate and fruitful exchange we decided to change the name of the society to reflect on our growth path that has produced significant results since the economic down turn and SCIP's strategic alliance with the Frost & Sullivan Institute as a measure to strengthen the Competitive Intelligence profession long term. Please find the press release on the name change and the official SCIP statement here. ALEXANDRIA, Va., Aug. 12 /PRNewswire/ -- On July 8th the SCIP (www.scip.org ) Board of Directors voted to officially change the 25-year-old non-profit organization's name from "Society of Competitive Intelligence Professionals" to "Strategic and Competitive Intelligence Professionals." This modification reflects the developing evolution of the competitive intelligence (CI) profession to support executive decision-making and firmly acknowledges the relationship between competitive intelligence and strategy. "This name change executes on the next phase of our strategic growth plan by emphasizing the importance of the CI profession to an organization's direction and success," said SCIP Immediate Past Chair, Martha Gleason of Blue Cross Blue Shield of Florida. SCIP Vice-Chair Scott Leeb of Prudential Retirement commented, "This name change acknowledges and formalizes what CI professionals have known for some time -- strategy and competitive intelligence are inextricably linked." "SCIP has evolved to become the global association for a broad range of professionals who directly support and influence strategy. To reflect this change in SCIP's name is only logical. Strategy anticipates and prepares our future and SCIP is a proud anchor for anyone who lends their skills and passion to it," said SCIP Board Member Jens Thieme of Lonza Group Ltd Switzerland. Support an added focus on strategic decisions, one of SCIP's principal goals. Include individuals who both work with and are customers of intelligence practitioners. Increase the connection of senior decision makers with their intelligence effort. Emphasize both the tactical and strategic orientation of our members. Create a unique value proposition by combining strategic and competitive intelligence. SCIP membership consists of private sector intelligence practitioners who provide skilled analysis on the competitive environment which enhances business decision-making and organizational performance. With the pace of technological development and the growth of global trade, today's business environment changes more quickly than ever before, so executives require additional informed analysis to make strategic business decisions. Don Heathfield - Russian Spy? It does not happen every day that you recognize a face you know well in the papers under the heading "CEO 'spy' with S'pore link". Someone I met on multiple occasions provided me just that experience this week. Exciting? Hardly! Having worked in the global Competitive Intelligence arena as a leading Intelligence Officer and as a Director of the Board of the largest Competitive Intelligence association the networks are colorful and interesting. Sometimes a bit too colorful it turns out. As reported in the global media, Don Heathfield (as we know today that might not have been his name) was arrested this week among 9 other people on charges of spying for the Russian secret service. Having dealt with Donald over the years at conferences and business meetings as well as casual chats and even personal lunches it strikes me how much one can be tricked into false identities or circumstances. Not wanting to comment on Don's potential involvement before he might even be convicted, the shock sits deep as I was actually under the impression to have dealt with a proper company and a reliable, solid and trustworthy CEO of FutureMap (Don's business). I still remember last fall when I asked him during lunch we had in Basel, Switzerland where his weird accent came from he responded candidly that his mother came from Eastern Europe. Something seemed fishy there as Don knew about my upbringing in former communist East Germany because it seemed odd that he did not mention a specific country in response let alone Russia. I clearly identified his accent on the spot but did not want to elaborate further for politeness. 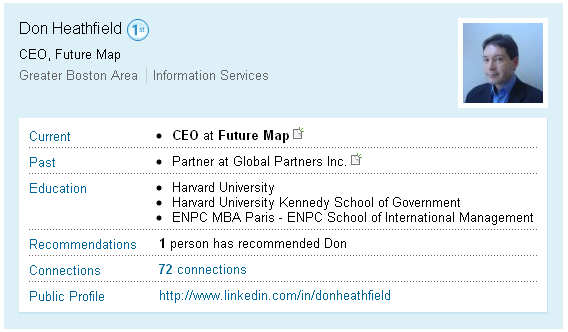 LinkedIn.com profile of Donald Howard Heathfield, clear name: Andrey Bezrukov or Андрей Безруков. Apparently Don and his wife confirmed the claims and have been swapped with agents and spies of interest to the US in the largest spy swap after the cold war. According to a Boston Globe article Don's Russian clear name is: Andrey Bezrukov or Андрей Безруков. "Bezrukov and Vavilova have two sons, a 20-year-old student at George Washington University and a 16-year-old student of the International School of Boston. Both left the United States in the past few days and are in Russia awaiting the return of their parents..."
"The agreement requires Bezrukov and Vavilova to forfeit their $799,000 Cambridge townhouse, all the belongings and cash within it, and their US bank accounts and other assets. They are also barred from profiting from any book or movie that tells their story, a common provision in such deals in American courts. In addition, they agreed to renounce any right to claim Social Security benefits they might have earned while living in the country. They also agreed to never to return to the United States and to abandon any claim to US citizenship..."
Donald Howard Heathfield, clear name: Andrey Bezrukov or Андрей Безруков. "Donald Howard Heathfield", clear name: Andrey Bezrukov or Андрей Безруков. Turns out Don and his "wife" Tracey Foley already had made arrangements for their children to be lured into spy roles as a second generation breed that would create much less alertness on the part of US authorities. "The effort to bring children into the family business suggests the ring was thinking long term: Children born or reared in America were potentially more valuable espionage assets than their parents because when they grew up they would be more likely to pass a U.S. government background check." - quote WSJ of today. The Guardian writes about the sons who were born Canadians and had to relocate to Russia with their parents. A personal drama on a totally different level. How to improve your blogger.com blog in search engine ranking and traffic generation based on the position that the individual page titles have within the title string that you see in the browser title line. Recently I noticed a dramatic drop in traffic with all my blogger.com blogs that I run in blogger.com (umfinanzieren.com,undebt.org, viertesreich.info, kopfgeburt.info, http://www.whackedsigns.com/, http://www.climatologists.org/, http://www.boycottregimes.org/, http://www.againsttorture.org/, http://www.ituneseurope.com/, collectedspam.com). When opening any of the individual pages (posts, click at the post itself and the dedicated page opens for this individual entrance in your blog) I noticed that they all showed the blog title in front of the title string and the blog post titles were hidden behind the title. As many of my blogs carry quite some keywords to attract targeted visitors in general the position of the individual blog post page titles (the name, titles of the various posts when they are posted) they would hardly be recognized by search engines and thus ranked very low in the search engine rankings. Or in other words: the blog pages, based on their title did not differ much from any other in the blog and thus could not unfold the meaning of the pages content and attract the targeted traffic. There is a simple trick to find out how search engines read and display back to users what they recognize in terms of your blog's page titles. Go to google.com and type: site:yourdomain.com (whereas yourdomain.com should actually be your real domain). The result page will list all pages as recognized by Google and here you might notice, as I did, that all individual blog pages are "labeled" with the title of the blog in general and the individual page titles might be positioned at the end of that title. See, search engines consider the beginning words of a page title most important and rank the pages accordingly in their index. So, if all your pages carry the same content in the first 5 or 6 words of the title string, they all rank equal and there is no targeting of content possible. This diminished the value of your blog pages and content and dilutes the entire value of the blog and its concept. Fortunately there is a fix that you can apply which does not require specialist knowledge. Find the blog you are working with. In the window that shows the template HTML code position your mouse cursor and copy the content of the template with the keyboard keys CTRL+C. Open your favored plain text editor and paste the content there by using the keyboard keys CTRL+V and save the file on your desktop so you can easily find this backup copy later and delete when done (this is just for backup, in case you mess up the HTML code so you can easily replace the messed-up code with the original backup content). Now save the HTML template by using the orange Save button in your blogger screen and you are done. For testing, open your blog and click at an individual blog post page title and you should see the targeted, individual title now in your browser top tab or frame. It worked for me, let me know if it did for you or if you tweaked it any other way. After a couple of very fruitful, active and rewarding years at the board of the Swiss Competitive Intelligence Association (SCIA) new ventures in my professional life dictate another mile stone to be completed. With my relocation to Valais and the new challenge to build a new, global contract management function for the world's largest Contract Manufacturing Organization in Pharma, Biotech, Life Science I had to hand over my board membership to two new SCIA board memberswho are in fact very well known CI seniors and will enrich SCIA greatly. To my former fellow board members Maarit, Urszula, Kurt, Robert and Thomas I would like to say: "It has been a great honor and pleasure to serve our Swiss Competitive Intelligence practitioners and collaborate with so many consultants, scholars and partners over the years. I will miss the friendly and productive, creative discussions at board meetings and in pubs, the gatherings at global SCIP conferences and the occasional chat in between. I am sure you will continue to have fun and success and be able to build this society stronger and more robust over time. You have become great friends, advisors and colleagues and I am proud having been part of the SCIA success story for some time." To Monika and Chistian I would like to express my congratulations and thanks for the nice hand-over experience and our other encounters over the years as CI professionals. You all are welcome at any time down here in beautiful Valais. To the SCIA members, sponsors and partners I would like to express my deepest gratitude to be loyal, forthcoming, demanding at times and always friendly in any way. Serving you, learning with you, driving the Swiss CI community forward has been a pleasure beyond words and I thank you for that experience and the unforgettable evenings in Zurich the past years. As a long time Global Intelligence Alliance customer I have grown familiar with their services and impact. The CI Development Roadmap had helped me in my former function to establish a CI function for a global chemicals conglomerate. This new installment of workshop, Competitive Intelligence Magazine article and White Paper on the GIA Competitive Intelligence Roadmap plus my personal experience with it in a corporate setting was sbject of the November 24 workshop in Zurich for the Swiss Competitive Intelligence Alliance. As you can find in below's documents GIA describes a CI function's evolution in 5 potential development stages across 6 distinct success factors. The matrix they use compares the functions of CI organization, scope, process, culture, tool and deliverables. As a global Market & Competitive Intelligence executive I turned this matrix into a sophisticated survey and program for my former management to determine the status quo of the then CI function, compare with best practice whereas the gap analysis resulted in firm mandates by these very executives. Have fun studying the material and let me know if you have any questions. It is always hard to give up a project. Due to my career move this was a no brainer though as the new owner is on top of the CI solutions provider list. Over the past couple of years you have come to know me as the founder and owner of Markintell.com, a regular speaker at SCIP and SCIA events, publisher of various intelligence related works and (some of you at least) a CI colleague and friend. With a very recent career change I have decided to transfer Markintell.com into the hands of a very professional, traditional and well embedded CI solutions provider - Digimind. I was just not in the position to contribute enough anymore as my private live and career options shifted quite substantially (incl. relocation, new industry and job position). Sad and nostalgic at first, both the personal changes and the new ownership for Markintell.com excite me now very much as you, the user, will be served much better from now on with valuable, frequent content and I can concentrate entirely on the new field. As a member of the Board of Directors of SCIP I will still remain well connected with CI and continue to serve the global CI community. Especially within my function as SCIP’s Chairman of the International Advisory Committee (IAC). Please feel free to follow me on the established business networks, contact me in any regard (both via www.thie.me) and receive my gratitude for having been an excellent audience to me on Markintell.com. Finally, please continue to support the new owner of the site with ideas, suggestions, contributions and challenges to the site will continue to grow along your needs as CI professionals. My best wishes for your future both personally and professionally, Jens Thieme (www.thie.me)..."
So, that was it - but wait: check out the very first post by the new owner and you will absolutely know that: more umph means more value for the Markintell community and this, my friends, is the best wrap up of a success and fun story for me - and undoubtedly a new era and success for Digimind and Markintell.com for many years to come! November 24 I will run a leaner version of the half-day workshop I gave in Amsterdam at the European Competitive Intelligence Summit by SCIP November 4th. Hope to greet you there and this time I also hope to be able to run the show with Hans Hedin who needed to stay back home this time around. As every year the Society of Competitive Intelligence Professionals (SCIP) elects new members of the Board of Directors. Dear SCIP members, please consult SCIP's strategic plan and the background information on this year's candidates to support your vote. As you know, the society will take a quantum leap after the successful, member supported strategic alliance with the Frost & Sullivan Inistitute has been activated. International CI communities will require more professional support, global and regional competitive intelligence events will have to be created and run. With the help of the mentioned alliance and the elected board the SCIP/FSI teams will be in a much stronger position than ever to enable improved membrship and partnership services for vendors and academics alike. Please cast your vote to have your requirements covered in the next years going forward. Registration for the 2009 European Competitive Intelligence Summit in Amsterdam, The Netherlands, is now available. Please come and join me at this conference which might become the largest Competitive Intelligence professionals gathering ever in Europe. After last year's huge success in Rome (yeah, in the middle of the economic downturn shockwave) here is another installment of the European version of SCIP's annual CI conference. Running a pre-conference workshop this time with my friend Hans Hedin of the Global Intelligence Alliance (GIA) I will be in best company with scores of global CI experts. Check out the program here and register via the brochure or at SCIP's website. At the Swiss Competitive Intelligence Association (SCIA) we are preparing a half day event to support our national members in their efforts to gain traction for their Competitive Intelligence related career paths. We were able to win quite a number of top notch speakers to the topic and I certainly hope that our members and additional interested CI professionals will join in numbers on September 29, 2009 in Zurich. Monika Giese (Switzerland) will talk about a case of an internal annual CI education program at a large global corporation and focus on the implementation of the Prescott/Comai CI model there. Stefan Schuppisser (Switzerland) is a leading business school professor and is just about to ramp up academic efforts here in Switzerland to support CI professionals and companies much more intensely as in the past. Rainer Michaeli(Germany) will introduce ICI's options to support your educational needs as a CI practitioner. So will Toni Nagle (United Kingdom) of ACI, SCIA members and interested visitors will learn about their opportunities to become better educated CI pro's from various angles. SCIP will support SCIA with material and a featured reading/commentary via phone by Bonnie Hohof (US) of SCIP. And finally Alessandro Comai (Spain) and John Prescott (US) will also dial in to introduce their World Class CI Model, share their experience in CI education and provide insights into career path supporting CI training options. All speakers in the room and on the phone will finally join forces in a major panel discussion fed by SCIA members questions (via survey as mentioned above) and live questions in the room and from the sessions. Join the events via this link. The Swiss Competitive Intelligence Association (SCIA) invited members and other interested Competitive Intelligence professionals to the 2009 summer evening event “World-class Competitive Intelligence Organizations: Academic Model vs. Reality” presented by Monika Giese, Basel (Switzerland). In her presentation Monika provided exciting insights in her decades-long experience as a leading Competitive Intelligence executive in the pharmaceutical industry at Smith Kline, Roche and Novartis among others. Sharing some best practice tips in terms of exposure within the own organization Monika introduced various models she recommended to develop and run Competitive Intelligence departments or functions within large corporate settings. With friendly permission of Jan Herring of ACI and world renowned business school professor and Competitive Intelligence scholar John Prescott of Katz Graduate School of Business Swiss Competitive Intelligence Association (SCIA) members learned about their models to evaluate internal Competitive Intelligence capabilities, identify gaps and generate solutions for sustainable Competitive Intelligence operations. At the Swiss Competitive Intelligence Association (SCIA)’s Education Day September 29, 2009 Monika will dive into Novartis’ example of organizing and running Competitive Intelligence education events featuring the world’s most known Competitive Intelligence consultants and scholars for all Competitive Intelligence professionals inside Novartis to excel in their tasks and Competitive Intelligence activities. John Prescott and Alessandro Comai will also join (by phone conference) the Swiss Competitive Intelligence Association (SCIA)’s Education Day September 29 among some other high profile Competitive Intelligence scholars and other speakers. Please find your way to Swiss Competitive Intelligence Association (SCIA)’s events via this events link. Monika Giese is in the process to establish her own business these days. John Prescott and Alessandro Comai are the authors and scholars of World Class Competitive Intelligence. Feel free to comment or post questions on or about Swiss Competitive Intelligence Association (SCIA)’s events as I might be in a good position to respond exhaustively as a member of the board of the Swiss Competitive Intelligence Association (SCIA). Joint half-day workshop with Hans Hedin of Global Intelligence Alliance at the 2009 Competitive Intelligence Summit by the Society of Competitive Intelligence Professionals (SCIP), Amsterdam November 4, 2009. At this year’s Competitive Intelligence Summit by the Society of Competitive Intelligence Professionals (SCIP) I will have the pleasure and honor to collaborate with Hans Hedin of Global Intelligence Alliance (GIA) to offer a half day workshop featuring Competitive Intelligence modeling I have used in my current role as Global Head of Market & Competitive Intelligence. The model is based on a framework to develop or improve a Competitive Intelligence function. Dimensions such as Competitive Intelligence processes, Competitive Intelligence organization, Competitive Intelligence culture, Competitive Intelligence scope, Competitive Intelligence deliverables are being evaluated with this model and solutions worked-out, offered for various development stages labeled from “Firefighters” (ad-hoc, spontaneous and on-demand fragmented Competitive Intelligence activities) towards “world-class” Competitive Intelligence function containing structured and fully integrated best practice Competitive Intelligence solutions. This workshop provides a hands-on learning experience about the key elements of a modern CI function and their development options. You will identify CI process elements, organizational setup options, the various scopes of a CI function, tools potential, cultural status and driving forces. Participants will also be guided through development stages of the various functions and identify key elements of each function. The framework will enable participants to determine the status quo of their own CI function and develop solutions for detailed improvements and sustainable progress. The workshop includes best practice theory as well as actionable real world examples to generate executive buy-in and move the CI function towards world class status. This is a joined workshop of a global intelligence consultancy and a corporate CI leader. You will walk away with a workable action plan to move your CI function from a given status to the desired end game in a structured way. This workshop will be of a highly participative nature. You will learn to apply the suggested methodology in your own organization. The presenters will use concepts, cases and real world examples in order to describe the evolution of a CI function. The participants will create a blueprint for their own development plan. This plan will be presented and discussed during the workshop, giving the participants the benefit of obtaining ideas and recommendations for how to proceed when implementing CI in his/her organization. If you are interested in more detail or want to register for this and other workshops at the SCIP conference, please visit SCIP's dedicated European Summit website. A Webinar presentation introducing the newest Global Intelligence Alliance (GIA) White Paper titled "World-Class Market Intelligence - From Firefighters to Futurists" was hosted May 6, 2009 by GIA where I featured a case study from my work as Global Head of Market & Competitive Intelligence. The GIA White Paper introduced and discussed Global Intelligence Alliance’s “World Class Market Intelligence Development Framework”. The model finds its base in GIA’s extensive consultative experience, and also relies on research into how hundreds of large organizations conduct intelligence. As I used the World Class Market Intelligence Development Framework within my role at Ciba (part of BASF today) I transformed theory into practice while developing and ongoingly improving the global Market & Competitive Intelligence function. The GIA White Paper features my case study which will also be subject to my half day workshop at the European Competitive Intelligence Summit in Amsterdam this November. Below you can find the Webinar slides and the White Paper that can also be downloaded via the Global Intelligence Alliance website.